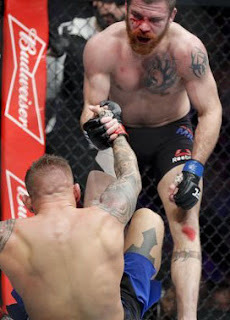 Journeyman are often underappreciated, if not outright ignored, members of the mixed martial arts world; these guys are all over every card, and in every division in every organization. Their story is really the story of combat sports and mixed martial arts specifically. While we focus on the prospects, the names, and the superstars, the journeyman plies his trade quietly, molding organizations, camps, and fighters with no fanfare, no big paydays, and no push from the organization. In this article I will educate you on the men and women who are the lifeblood of any and all combat sports. 10) A journeyman is a seasoned veteran who has faced every level, type, and age of opponent, sometimes winning, sometimes losing, but always learning and improving. Now at this stage of a fighter’s career, clearly out of their primes and with thousands of miles on their odometers, these fighters are depending exclusively on awareness, cage IQ, and career long refinement and diversification to keep them competitive and on the winning track. They aren’t bad fighters -- in fact in many cases they are very good fighters -- but they aren’t considered potential champions, contenders for championships, or marquee names. 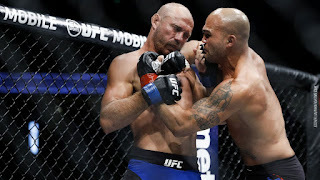 9) Due to the abbreviated time mixed martial arts has existed, and the excessively sharp curve in technical, strategic growth, this sport hasn’t recognized or appreciated the role these guys play. Journeymen are essentially the most important guys in the sport. The rookies might create waves of excitement, the superstars may keep the lights on, and the characters might help build fights and help them cross over. But the journeymen are the ones who fill the fight cards, in every organization, in every country, at every level. They are the ones who are the lifeblood of the sport in regards to growth in skill, experience, strategy and overall quality. 8) Journeymen are multi-purpose tools. They have a myriad of uses that benefit fighters, coaches, camps, and organizations. Unlike other types of fighters who are used for one or two things, the journeyman has many uses, all of which help push the sport as a whole on an organizational level, and the fighters/camps on an individual level. 7) Journeymen are known for gauging and exposing talent. A journeyman has the savvy and the broad skillset to avoid being overwhelmed or outclassed in any one aspect of his or her sport. This means that if a fighter facing him or her hasn’t been developed properly, or isn’t a transcendent talent, there is a better than average chance that fighter gets beaten. Don’t believe me? 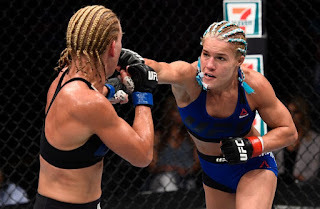 Refer back to Felice Herrig’s last three wins, all against young talented fighters, two of whom were undefeated. Kailin Curran, Alexa Grasso, and Justine Kish are very talented (but not exceptionally talented) unrefined fighters whose lack of layers and fine tuning led them to decisive losses. 6) Another use for journeymen is fighter development in an organization. What I mean by this is most journeymen aren’t fighters of incredible athletic ability or dynamic finishing ability; they are craftsmen. They’re good enough in all areas of combat technically, aware enough strategically, and seasoned enough mentally not to be blown out , dominated, controlled, or outsmarted easily (except by the special fighters). Facing a myriad of faded but still dangerous fighters allows a prospect to develop his or her timing, cage IQ, all-around skills, and ability to execute under duress and win fights when opponents won’t let them do what they want. Examples of fighters who have benefitted from this would be Sergio Pettis and Max “Blessed” Holloway. Both faced a series of journeymen as they slowly refined their skills and cemented their identities as mixed martial arts fighters. 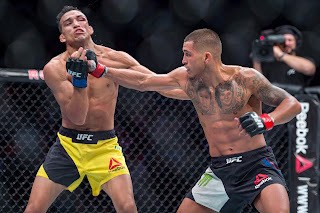 Holloway is currently the UFC Featherweight Champion, having soundly beaten all-time great, Hall of Famer, and first UFC featherweight champ Jose Aldo, and Pettis is on a four-fight winning streak punctuated by a dominant win over a Top 10 flyweight, which has catapulted him into position as the next contender for pound-for-pound king and UFC Flyweight Champion Demetrious Johnson. 5) Journeymen can be used to rehab fighters. Have a fighter on a losing streak who needs a win, but needs it over a credible opponent? You bring in the journeyman, good enough to beat the “name” fighters if they are shot or ill prepared (which is what helps sell the fight) but not good enough to beat that caliber of opponent consistently. This is what helps make the fight -- if the “name” fighter loses, you can spin that the fighter lost to an experienced, still dangerous opponent. If the fighter wins, you can say that fighter is “back,” regardless of any lack of technical or strategic improvement. Don’t believe me? Look at Anthony Pettis; a win over Charles “Do Bronx” Oliveira springboarded him into an interim featherweight title fight with Holloway. The next time the UFC used the same trick with Pettis was with Jim Miller -- the win had people saying Pettis was still a player at 155 and essentially laid the groundwork for Pettis vs. Poirier later this year. 4) Journeymen can be used as promotional tools. Due to their activity and familiarity, journeymen have fan bases and are known among media. A prospect facing a certain journeyman will draw attention, as it is often seen as their first test (e.g., Swanson vs. Holloway; Pettis vs. Caceres). A fighter on the comeback can create interest by facing a journeyman because he is a “tough out” (see Dos Santos vs. Hunt). In cases of championship fights, the “underdog” story (Hunt vs. Werdum, Bisping vs. Rockhold) is used to draw eyes and inspire discussion. 3) The road to being a journeyman is a marathon, not a sprint. To develop the reputation, experience, and skill that come with being a journeyman, you have to spend a lot of time in the gym, even more time in the cage, and you have to have faced anyone and everyone. The value of the journeyman is experience, and you can’t get that turning down fights, missing days at the gym, not fighting often, and not fighting every type or level of opponent. 2) Some of your favorite fighters are or have been considered journeymen. Some of the biggest-named fighters are journeymen; in many cases they have had career wins or hot streaks that changed the narrative on them. Donald Cerrone, Robbie Lawler, and Roxanne Modafferi are examples, among others. 1) In the gym the journeyman has his or her biggest impact, often helping to mold, direct, and develop the skills of prospects and name fighters. So often they are considered coaches on the floor, full of knowledge, skills, and experience. They impart wisdom of all kinds that help turn unrefined talents in coaching and fighting into the finished products that fans, analysts, media, and fighters celebrate so often.